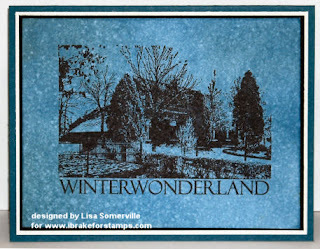 The Winter Wonderland image from I Brake for Stamps is a favorite winter image of mine. At this time of the year - it's almost like looking out my back door at the old barn and trees behind us covered in snow. To create the card shown here, I used the Spritz and Flick Technique - with a little morphing. I did stamp my image in Black Archival first and heat set, before adding my Faded Jeans Distress ink. I also used a Ranger Mini Mist Bottle, instead of flicking on the water - I wanted it to look more like a snowy background, and by doing this I was better able to achieve that look. Save 15% at IBFS when you used code SCS15 now through December 30, 2008! Beautiful technique, beautifully executed! Gorgeous stamp, too! As usual It is veryp artisty and pretty.